Britain has been urged to turn its back on the European Court of Human Rights because its rulings over detained prisoners potentially undermine Britain's 'special relationship' with America. 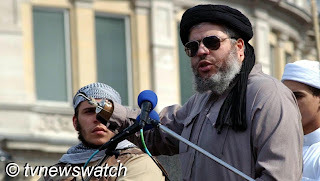 The call came from John Bolton, the American ambassador to the UN under George Bush, and comes as European judges sit to determine whether six terror suspects, including radical Muslim cleric Abu Hamza al-Masri, can be extradited from the UK to the US. "Britain should renounce the jurisdiction of this court. It's a question of what do British people want to do? Do you want to be an independent nation, or do you want to be a county in Europe?" Bolton said. "This is just another example of Britain's mistake in allowing European institutions to develop to the extent they have. It is yet another infringement on British sovereignty that undercuts its ability to cooperate with the United States." "It also calls into question the ability of Europe as a whole to be an effective partner in the war against terrorism." However, according to Daily Telegraph the delays have cost the British taxpayer an estimated £2.6 million to keep the six men in high-security jails. A further £1.5 million is estimated to have been spent on legal costs, including legal aid for the men, and thousands more on benefit claims for their families. "This is a crazy waste of money, and shows once again why we need a British Bill of Rights. People will find it incomprehensible," Dover MP Charlie Elphicke told the paper. Nick de Bois MP, a member of the Commons justice committee, also weighed in to criticise the current system. "We have a very distorted system that allows taxpayers to pay an obscene amount of money as a result of the discredited European justice system exploited by these suspected terrorists." Hamza, who was granted British citizenship in 1986, is wanted in America on 11 charges related to the taking of 16 hostages in Yemen in 1998, promoting violent jihad in Afghanistan in 2001, and conspiring to set up a jihad training camp in Oregon. Amongst the six suspects the United States is seeking to extradite, is an alleged terror fundraiser Babar Ahmad and two men, Khaled Al-Fawwaz and Adel Abdul Bary, who are accused of a role in two 1998 US embassy bombings in Kenya and Tanzania. The other two men are Haroon Rashid Aswat, who is accused of a being part of an alleged terror camp in Oregon, and Seyla Talha Ahsan, accused by a US court of running an extremist website and funding the Taliban [BBC / Sky / Guardian / Daily Mail]. The European Court of Human Rights has considered whether human rights would be breached if the men receive lengthy sentences in certain prison conditions. The suspects argue that they might be held in a high-security prison in Colorado, known as a "supermax" prison and claim that if convicted there is very little or no prospect of ever being released. The six suspects say conditions of detention at a so-called "supermax" prison would amount to ill-treatment under article three of the human rights code. The European code states: "No-one shall be subjected to torture or to inhuman or degrading treatment or punishment". Earlier this year, the European Court ruled that Jordanian terror suspect Abu Qatada could not be sent for trial from the UK to his homeland because evidence obtained by torture might be used against him. There are fears that Hamza himself could be ordered to be released by the European Court, which could create havoc in the coalition government. Even if the extradition goes ahead it will have been a long and arduous journey for the US judicial system. The offences committed date back to more than a decade ago preceding and following the 9/11 terror attacks. Charges and an announcement of a trial in connection to suspects involved in those attacks were only announced last week. The Defense Department referred charges against five suspected 9/11 co-conspirators to a military commission on the 4th April. The charges allege that Khalid Sheikh Mohammed, Walid Muhammad Salih Mubarak Bin Attash, Ramzi Binalshibh, Ali Abdul Aziz Ali, and Mustafa Ahmed Adam al Hawsawi were responsible for the planning and execution of the September 11th, 2001, terrorist attacks on the United States. The case was referred to a capital military commission, meaning the five accused could be sentenced to death if convicted [defense.gov / BBC]. The decision concerning the six terror suspects including Abu Hamza is expected later today, Tuesday 10th April. The European Court of Human Rights has backed extraditions from the UK to the United States for all but one of the six terror suspects. The Strasbourg court say there would be no violation of human rights for those facing life and solitary confinement in a supermax prison. However, judges said they could not yet give the go-ahead to the extradition of Haroon Rashid Aswat because they needed to see more submissions on his schizophrenia and how that would be treated were he sent to the US [BBC / Sky].